AeroNavData uses a Visual Procedure Check (VPC) tool to display either ARINC or DAFIF® coded instrument terminal procedures that simulate how a flight management system (FMS) would fly the data in an airplane. The VPC (or referred to as “DPC” when used with DAFIF®) is one of many processes implemented that can be effectively used for procedure validation in advance of publication of the procedures. 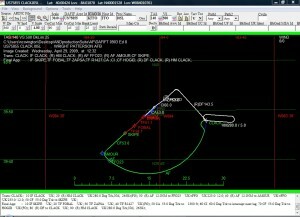 These tools can be used either in conjunction with the AeroNavData Production Tool or as a stand-alone program. A s one of many processes used for procedure validation, VPC/DPC detects data errors or anomalies prior to customer delivery. In addition to a simple visual verification, the tool allows the analyst to assess the impact of alternative aircraft characteristics and meteorological conditions when evaluating an approach procedure.